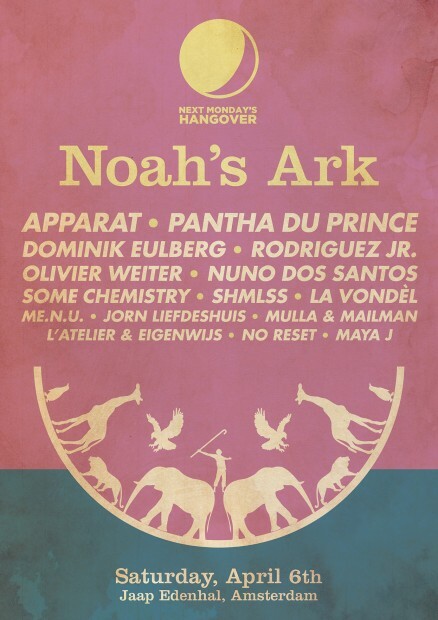 Next Monday’s Hangover is heading back to the Jaap Edenhal for another indoor festival of epic proportions. In continuation of last year’s biblical Garden of Eden theme they’ve decided to team up with one of history’s most famous party animals: Noah, head of the famous Ark Club. His parties are known for high diversity in species, equal distribution of men and women and everyone behaving like wild animals. For their return to Jaap Eden they have some serious expansion plans. This year they will open the stands, shrink the dance floor and upgrade the sound, light and decor to a whole other level. Expect something you’ve never seen in Amsterdam before. They have what is probably the very best line-up in NMH’s history prepared for you. And oh yes, be sure to look, feel and dance like a wild beast for this one. Sascha Ring, aka Apparat, regards his moving out of the east German provincial backwater to Berlin in 1997 as one of his best decisions ever made. Apparat is the bridge over the German gap of melancholic glitch between Manchester and Laptop-USA. His smart wiring of emotions produces a virtual musical reality, which is based upon different genres, depending on the surrounding of the “apparat”. Olivier Mateu’s wide-ranging inspirations and interests find their ultimate outlet as Rodriguez Jr., positioning him as mobilee’s new master of eclecticism. He strides ahead, guided only by his kaleidoscopic vision; moving through shimmering, contemplative electronica, to deep and urgent techno, leftfield melodic accents and quirky pop refrains, Rodriguez Jr. is the by-product of an untamed brand of creativity and a thirst for the new and unexpected. Of course, our residents Olivier Weiter, Nuno dos Santos, Some Chemistry, La Vondèl, ME.N.U., Jorn Liefdeshuis, Maya J and No Reset will be all present to support this event accompanied by special guests SHMLSS, L’Atelier & Eigenwijs and Mulla & Mailman in their best animalistic behavior. Finally, as said before, they did it before and will probably do it again: transforming this indoor ice skating dome called Jaap Eden into an off-location you won’t forget about in the near future. To be more specific, we’ll be turning this venue into a proper ark supplementen with the common surprises you’re used to from us. To get an idea, have a look at what we set-up last year.